Oh, I have knit, I have painted, surely that’s all I accomplished this New Year, right? Wrong! 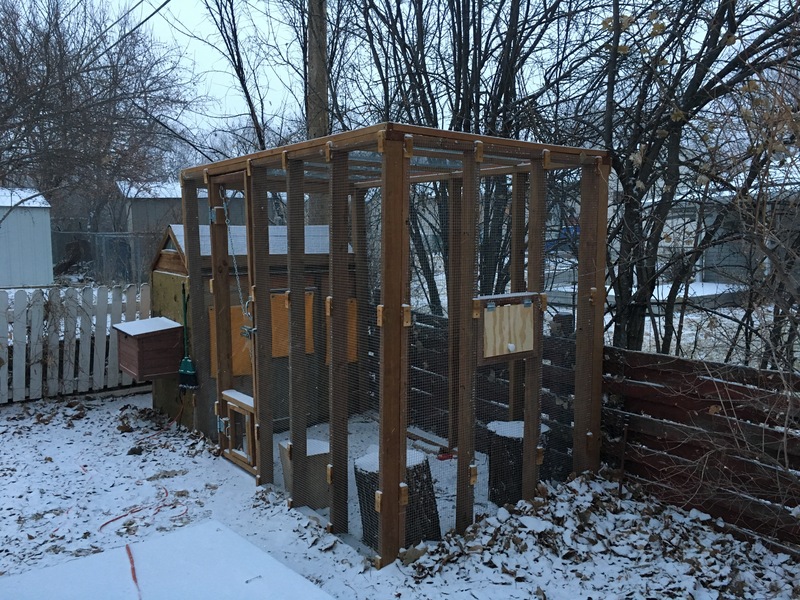 On New Year’s day I completed a project to ensure my chickens stay warm through subzero winter temperatures. I made window blankets for our chicken coop. What is a window blanket? It is Mr. Afthead’s brainchild, which I executed. (Okay, he helped with the grommet hammering part.) Window blankets are insulated pieces of fabric created with hanging mechanisms at the top, which can be placed over the windows of the chicken coop to provide insulation and protection from our chilly winter days and nights. They also keep snow from blowing into the coop. Let me show you some pictures. Three small window blankets installed on the coop. I think the window blankets provide a nice pop of color in the chicken run too. Thankfully these got finished before the snow and subzero temperatures arrived this week. What!?! No! These are not just curtains! Curtains go on the inside of structures and these are on the outside. Also, curtains must be ironed and sewn with matchy matchy thread, and these do not. Finally, these might get chicken poop on them, and that’s probably not a concern with your curtains, right? Totally different. The only similarities are that they are made of fabric, cover a window, and must be measured with a smidgen of accuracy. Let me tell you, we may have to patent these wonderful window blankets, because this past week the chicken coop was eleven degrees warmer than the outside when we had the heat lamp on and the window blankets attached. 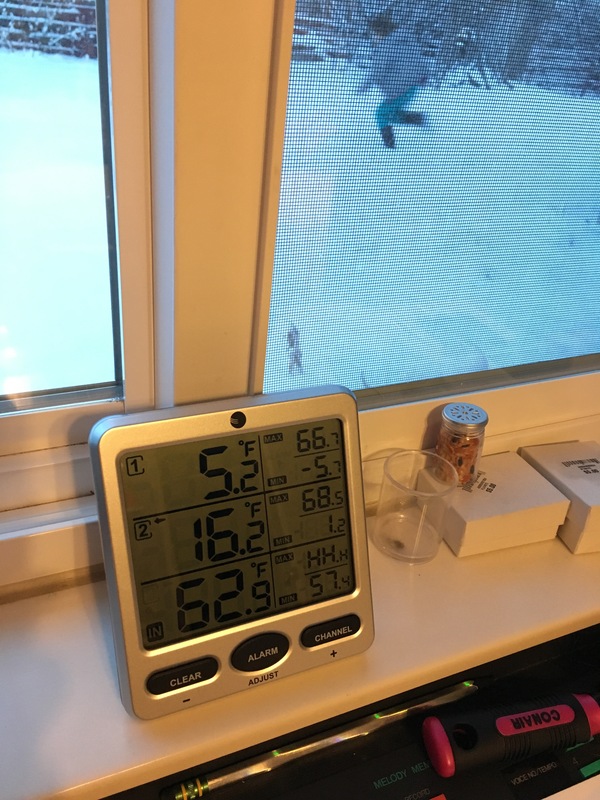 Without the window blankets the difference was 4 degrees. So the chickens are staying toastier thanks to my handiwork and my husband’s invention. It’s the least we can do for these feathery gals who keep giving us eggs and provide us so much joy. Wow! Nice invention. How many eggs do you get a week now? Wow! Let me know if you ever need to get rid of some! This summer I’m sure there will be an abundance of eggs to share. Those are great! I would love chickens but cannot have them. Though it has been enough taking care of a budgie this week who is sick with a runny nose/beak. Keeping him warm, washing and wiping a budgie nose! He is so cute though when I do it. We thought death was near on Wednesday. Seems better today, whew! I have to admit, I had to google what a budgie was before I responded to your note: a parakeet, right? I had no idea that birds got runny noses/beaks. (I’m new to this whole bird ownership thing.) I hope he makes it through his illness. Yes it is a parakeet. The first day seemed like he wouldn’t make it through the night, I was silently freaking out. He is a talker and I can’t imagine being able to find another like him. He is better now, dodged that bullet! I know I appreciated not worrying about them when the temperature dropped below 0 this past weekend! They seem pretty content too. You may have a big idea on your hands! I can imagine lots of people wanting these. I’m sure they are making the chickens very happy. I’d need to improve my attractiveness factor if I started making them for others, but the chickens seem toasty and warm. We’ve made it’s through two subzero stretches so far with no frozen chickens!